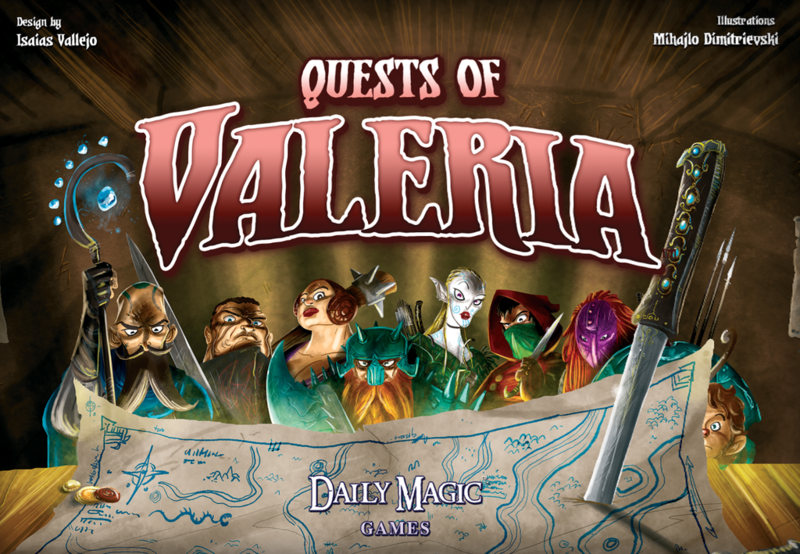 Quests of Valeria is a game by Isaias Vallejo, published by Daily Magic Games. It is for 1-5 players. In this game, players take on the role of a famous Guild Master in the fantasy city of Valeria. They will need to hire the best citizens to take on the most dangerous quests in order to gain the most prestige and become admired by the citizens and King of Valeria. They’ll do this by gaining victory points. In the end, the player with the most victory points will be declared the winner. To begin, the Guild Master cards are shuffled together. Each player is then dealt 1 of these cards face down. Players will look at their card and place it face down in front of them, keeping it secret from the other players. Each player will also be given a Player Aid card. The remaining Guild Master and Player Aid cards are returned to the box. The Card Cost tokens are placed in the middle of the play area in order from left to right beginning with the 0 and ending with the 3. The “Hire From Your Hand = 2” token is placed to the right of the 3 token. The Citizen cards are shuffled before dealing 3 to each player. This is the player’s starting hand. Six cards are dealt out face up below each of the Card Cost tokens, forming the Tavern Line. The remaining cards are placed face down below the “Hire From Your Hand = 2” token. This is the Citizen deck. The Quest cards are shuffled and a certain number of cards are dealt out face up above the Card Cost tokens. The number is determined by the number of players, normally this is 6. For a 2 player game it is 4. These are the Active Quests. The remaining Quest cards are placed face down above the “Hire From Your Hand = 2” token. This is the Quest deck. The first player is chosen and is given the 2 Action Tokens and the First Player token. Play now begins. The game is played over a series of turns. Each player will take a turn consisting of 2 phases, beginning with the first player. Those 2 phases are the Action Phase and the End Phase. The first phase is the Action Phase. In this phase, the player must perform 2 actions from a list of 4. Each action is able to be taken more than once. Each time the player takes an action, they will pass an Action Token to the next player in turn order, starting with the token with the number 1 on it. This will help remind the player how many actions they have taken and how many they have left. Once they have passed the second Action token and completed their second action, play moves to the next phase. The 4 actions that a player may choose from are draw, hire, reserve and quest. For the Draw action, the player will simply draw a Citizen card from the Citizen deck and place it in their hand. At the end of a player’s turn, if they have more than 8 cards in their hand, they will be forced to discard down to 8. For the Hire action, the player will choose one of the Citizens from the Tavern Line and place it face up in front of themself. This area is known as the player’s Guild. They will then have to discard the required number of cards shown on the Card Cost token above it. Alternatively, the player may hire a Citizen from their hand, paying for it by discarding 2 other cards from either their hand or their Guild. Once the Citizen is placed in a player’s Guild, the Hire Power of the card is activated. This power can also be activated if the Citizen is placed in a player’s Guild from completing a Quest. Just like with cards in a player’s hand, there may only be 8 Citizens in a player’s Guild at the end of their turn. If there are more than that at that time, they will be forced to discard down to 8. For the Reserve action, the player has 2 options. They may take 1 Active Quest from the Tavern, placing it face up in their Guild as a Reserved Quest or they may discard all the Active Quests from the Tavern, immediately refilling it with new Quests from the Quest deck. They will then take 1 Active Quest card from the new line of Quest cards and place it face up in their Guild as a Reserved Quest. A player may only have 1 Reserved Quest in their Guild at a time, but may discard the previously placed one to make room for the new Reserved Quest. For the Quest action, the player will select an Active Quest from the Tavern or their Reserved Quest in their Guild, discarding the Citizens from their Guild that fulfill the requirements listed on the Quest card. This includes both Citizen Role and Resource icons. It should be noted that Citizens from a player’s hand may not be used to fulfill these requirements. After discarding the cards to meet all the requirements, the player will take the Quest card and place it face up in their Guild. The player then gains any bonus actions shown on the card. Once the bonus actions have been completed, the card is flipped face down. This brings us to the second phase of a player’s turn, the End Phase. In this phase, the active player will refill any empty spaces in the Tavern with new Quest cards by drawing cards from the Quest deck and placing them face up until the Tavern is completely refilled. The remaining Citizen cards in the Tavern line are then slid to the left to fill any empty Card Cost slots. New Citizen cards are drawn to fill the empty spaces starting with the right most space. Once these actions are completed, the player checks their hand and Guild to make sure that they don’t have more then 8 cards in either their Guild or their hand. Excess cards are discarded if the limit is exceeded. Play then passes to the next player in turn order. The game continues until the game end is triggered. This happens when a player completes their fifth quest. Play continues with players taking their turns until the turn order returns to the player with the First Player token. The game then ends. Players will count up their Victory Points on their completed Quests, adding any bonus Victory Points due to their Guild Master’s End Game Power. The player with the most Victory Points is the winner. There are lots of truly amazing looking cards and pieces with this game. The artwork on the cards is great. It looks a lot like the art on other games in the Valeria series. Each of the Citizen and Guild Master cards has a great painted design of the person it’s supposed to represent. The Quest cards have a thematic looking scene depicting whatever the quest is centered around. I love the artist’s work and designs for this game. There are also some Player Aid cards with a great overview of the Action and End phases of a player’s turn, as well as a reference for all the icons in the game. These are very handy to have and are a great addition. There are several cardboard tokens for the game that are made of thick cardboard and are fairly sturdy. 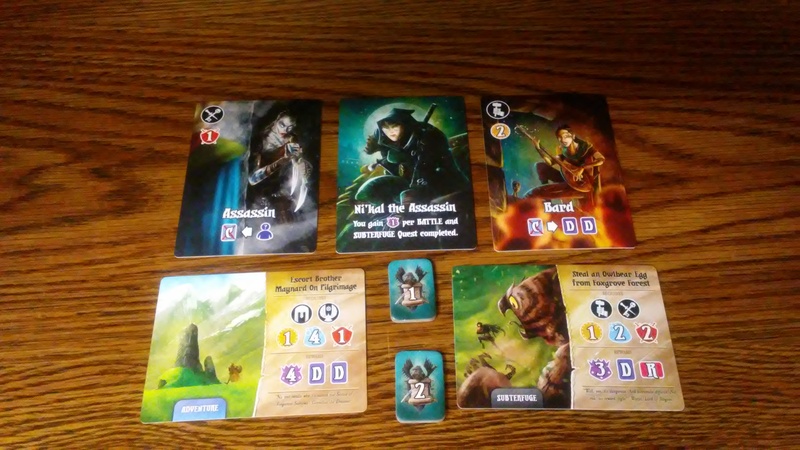 There are 7 Card Cost tokens for creating the Tavern Line with, as well as the 2 Action tokens and the First Player token. The Card Cost tokens simply have a large number inside a square white box on a colored background. The Action and First Player tokens are a bit more colorful and have a little more artistic flair to them. Overall I really like the look and feel of this game. The cards are amazing and everything works really well together. About the only thing that I could wish for would be some type of thematic play mat to place all my cards on. Otherwise, the game is just fine the way it is. I’m very happy with everything in the box. The rulebook for this game is very nice as well. It looks great with plenty of pictures and examples throughout the book. The rules are all explained in great detail and are easy to understand. There is a section devoted to just explaining the different icons in the game which is very helpful in learning the game. There are sections devoted to each card type, explaining what each aspect of the card is and does. There is even an option for solo play included in the book which I’m very greatful for, as I’m always on the lookout for new games to play by myself. The back page of the book has a very nice quick play reference that includes setting the game up, the basics of the Action and End phases and the End Game and Scoring. The book fits perfectly inside the smaller game box and isn’t too think or overly wordy. Everything is extremely easy to read and understand. I really like the overall look and feel of the rulebook. It’s well designed and looks great. Let me go ahead and spoil this section for you. I really like this game. I enjoy hiring all the different Citizens to my Guild so that I can complete the different quests earning the honor and respect that my guild so richly deserves in the form of Victory Points. I love that this feels like a quicker and lighter version of Lord of Waterdeep, which just so happens to be one of my all time favorite games. I love that there is a solo option that Lords of Waterdeep doesn’t have. That means that I can sit down with this one and play a quick game by myself and scratch that itch. It also has a fairly small footprint on the table, meaning that it can be played in a lot of different places. The small box and small footprint make it easily portable. The game also has a few similarities to Splendor, in that you can be working on getting what you need to complete a particular quest and have it snatched up before you can get it finished. Much like how a noble can be taken out from under you in Splendor. In other words the game has some set collection and a bit of take that mechanics to it. It works really well with 2 or more players. It’s also quite fun solo. However, the solo game is more of a score the most points and compare them to see how well you did kind of thing. I don’t normally like playing that way, but over the years I’ve learned to like this play style a bit better. With the great looking cards in this game, it’s a bit easier to enjoy too. This is not a difficult game and it doesn’t take a lot of strategy either. This is one that the whole family, even the kids, can enjoy. I feel like fans of games like Lords of Waterdeep or Splendor should enjoy the theme and gameplay mechanics of this one. For me I like playing it and I would highly recommend it. Quests of Valeria is a light weight fantasy themed card game centered around hiring Citizens and completing Quests to earn Victory Points. The game isn’t too long. Most game sessions last around 30 minutes or so. The designs and artwork on the cards is truly amazing. I love the art style by this artist. It’s so much fun to look at. The game has a lot of mechanical similiarites to Lords of Waterdeep and Splendor. Fans of either of these games should enjoy the theme and mechanics of this game. It’s a family friendly game that can also be played solo. I personally enjoy playing it both ways, even though the solo version has you trying to score the most points. Overall this is a really great game that I would highly recommend. Now if you’ll excuse me, I need to see a barbarian about getting rid of some owlbears in my barn. This entry was posted in Reviews and tagged board, board games, card, card games, daily, daily magic games, games, isaias, Isaias Vallejo, magic, quests, quests of valeria, valeria, vallejo. Bookmark the permalink.